The Benross Group, provider of quality items for your home and garden. A great multi-purpose lantern from the Milestone camping range. The Remote Control Lantern has a full 5 Watt flourescent bulb inside providing a high quality light. 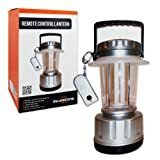 This lantern is also able to be controlled by its own remote control making it ideal for sleeping pods as well as general living areas and can be controlled from a distance so you dont have to get up or disturb someone else to throw some light on or turn lights off. The lantern is powered by four D Cell Batteries that are NOT included.